Just for something different, and to prove that no two gamers think alike and that you should not limit yourself to one reviewer, we have decided to give two perspectives on the latest chapter in the Simon the Sorcerer saga. As flotsam won the arm wrestle, he gets to go first. I have never played a Simon game, so this experience wasn’t going to be either enriched or diminished by comparison with what went before. Which some may say is a problem, given that a little bit of research suggests that the character of Simon has evolved as we have gone along, and even that this Simon might have de-volved just a bit, being more like he was in the earlier games. As I said, I have no idea, so I will have to take him as I find him. Which is asleep, until a knock on the door interrupts his nap. Simon answers, and is confronted by aliens, and not nice ones either. It’s an invasion, one which leads to a kidnapping and smelling like a mole. Plus a lot of inventory based conundrums and an equal amount of dialogue. Past characters are present, including Alix his love, Goldilocks and Little Red Riding Hood. The moles appear new, as do the Nihonians. I have to say this wasn’t my cup of tea. The story was ok, but the humour was anything but humorous, and the voice acting, with a few exceptions, was fairly awful (if there is a worse game voice than Swampy, it can only be Mustavio in Keepsake). The game felt like it had been designed primarily for 14-year-olds, with some occasional rude words and bouncy breasts thrown in to spice it up a little. Add some silly stereotypes and it all just left me flat. Which is a bit of a shame, because if inventory conundrums are your thing, there are a whole lot of them here. There is also a rather good hint system, and cursor keys to tell you where all the hotspots are in a scene (should you want to know) as well as all the exits. It’s also nicely drawn, if a little flat and muted in colour. It isn’t as richly or as sharply drawn as say the Runaway games, or the later Broken Swords, but the slightly ramshackle appearance suits the events. 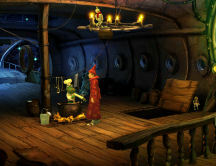 Some scenes are also observed from a perspective other than the ‘traditional’ side on view, which gives the game world some variety. I thought the character modelling was a high point, not from a technical perspective (the ventriloquist-doll eyes were a little freaky) but in terms of each character being distinct and suited to their particular profession or predilection. I say that of course without knowing what a real Nihonian looks like. Of course, humour is in the eye of the beholder, as are a lot of other things, and so the fact that it didn’t appeal to me proves nothing other than it didn’t appeal to me. The game boards suggest there are plenty of people enjoying the game as I write. 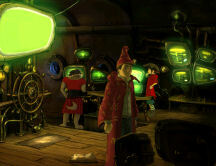 Simon 5 is third person point and click, driven entirely by the mouse. Right click to examine, left click to pick up. 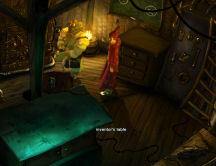 Move the cursor to the bottom of the screen to bring up the inventory, where you can further examine and combine items. Simply click, then click in the game world to use them. Double click to run. It’s easy, and is explained by a little tutorial from Simon very early on. Dialogue trees are prevalent, and Simon will repeat the chosen phrase. As I said earlier, there is quite a bit of dialogue, and at times it contains triggers and other information necessary to move forward - so exhausting conversation topics is advised. You can click through it if you want to (although you won’t then know what is going on). F1 brings up the journal, which keeps track of your tasks, and warrants looking at if you aren’t sure what you are supposed to be doing. 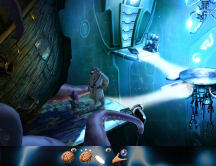 You access the hint system through the journal as well, with three levels of hint given for each conundrum. I used it here and there, and it worked well. It’s a good length, depending of course on how laterally you think at times, but the volume of conundrums will probably mean it will keep you going for ten hours at least. If you save before dealing with the green dragon, you can also play three different paths for resolving that particular puzzle. Simon 5 is probably one you will have to pass judgement on yourself. Which isn’t terribly helpful, but it is honest! As a gaming experience, I can’t give it any more than a C+. The humor in Simon 5 aims to return to that in Simon the Sorcerer I and II. The classic Simon way is to express eagerness to save the world while being obnoxious and sarcastic along the way. Simon 5 follows this formula, but it's weighted down with long dialogs. Conversing with Swampy, Red Riding Hood, the Genie and Captain Narrow was tedious -- sometimes even painful. Some of the "adult" humor was almost cringe-inducing. Simon retains his American accent from Simon 4. I know this will disappoint fans of Simon 1. If it's any consolation, the actor does a good job, especially considering some of the awkward dialog that he voices. On the plus side, Siegfried’s War Hammer is a great character, whose talents and pithy statements light up the journey. 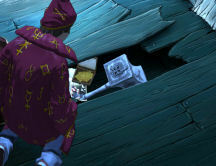 The character of the Big Bad Wolf takes an unexpected turn near the end, which is the funniest sequence in the game. 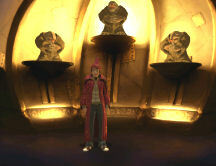 It's as though, in these later sequels, Simon has become a foil; the game is most entertaining when other characters take the lead as anti-Simons. 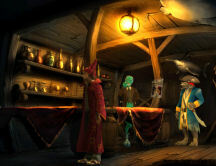 The graphics evoke the original Simon games and are much more cartoon-like than those in Simon 4. The environments are colorful and creative and fun to explore -- I particularly liked the habitat of the giant moles. If you enjoy dastardly, often clever inventory challenges, you will find many here. The special gadgets provide variety -- one gadget allows you to search for various substances and one measures the energy level of everyone and everything, with some entertaining side commentary from Simon. The Wolf's "gifts," which he must first discover and then use late in the game, also make for amusing challenges. There are positive aspects to this game, but you have to wade through a lot of stilted dialog and unlikeable characters to appreciate them. If you are a fan of the first two Simon adventures and of politically incorrect stereotypes, you should try this one. If you enjoy inventory based adventures and cartoon-like graphics -- and if you can overlook the lengthy dialogs and one-dimensional characters -- you might also give it a whirl. I give it a B-. Simon the Sorcerer: Who'd Even Want Contact?! can be purchased via download at Gamers Gate.